Literary agent, Sarah Manning, at The Bent Agency. Sarah started out as an assistant to Juliet Mushens at United Agents before becoming an agent to develop the adult fiction list at the Bent Agency’s UK office. Her taste is varied and she’s looking for commercial and accessible literary adult fiction, YA and nonfiction, including uplifting women’s fiction in the reading group space as well as love stories that make her cry. She represents high-concept thrillers and crime books full of twists and turns with interesting settings and speculative fiction – but nothing that feels too unrecognisable from our own world. Keep an eye out on the blog as we’ll have an interview with Sarah soon about what impresses her when submissions land on her desk. Sign up for our mailing list so you’ll get notified when the blog interview goes live. Submission package review and feedback from Sarah Manning. Submission package review and feedback from Amanda Saint, publisher and commissioning editor at Retreat West Books. Short feedback from Sarah Manning on 1st chapter she reads during the judging process. This is provided in the blog announcing the results. Submit your first chapter only through Submittable using the button below by 23.59 GMT on 27th January 2019 (sorry – any entries that have included prologues, more than one chapter and/or a synopsis will be disqualified and fees will not be returned). First chapters must be written in English and can be up to 3,500 words (no minimum word count) and on any theme and subject (except children’s fiction). Please use 12pt font and double spacing. Name the document you upload with your novel title. Do not include your name on the chapter, the title of your entry or the document you upload as it is judged anonymously – instead submit your contact details and short bio separately in the cover letter section as we cannot see this until we have chosen the shortlists. Any entries that have the author’s name on them will be automatically disqualified. The novel should be unpublished and not have been accepted by a publisher – if it is accepted by a publisher after submission but before the judging takes place then it will no longer be eligible and entry fees will not be refunded. You can enter as many times as you like but each entry must be made separately and the entry fee paid each time. Long and shortlists will be announced in April 2019 and the winners in June 2019. The 10 shortlisted chapters will go to Sarah to choose a winner and second-place chapter from and she will then provide detailed feedback on the winner’s first 3 chapters, cover letter and synopsis. The writer in second place will receive feedback on their first 3 chapters, cover letter and synopsis from Retreat West founder and publisher at Retreat West Books, Amanda Saint. All of the shortlisted entries will also receive short feedback from Sarah in the blog announcing the winner. 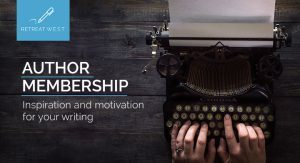 If you sign up as a Retreat West Author Member you’ll get entries to these competitions included in your benefits package, as well as whole load of other great stuff to get you writing, learning and submitting more. Get info here.